Nata de Coco is a product of fermentative action of Acetobacter xylinum- a thick translucent, gelatinous food product. 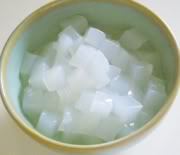 Nata de coco can be sweetened as desserts or candies. It is commonly used as an ingredient in sweet fruit salads, pickles, fruit cocktails, drinks, ice cream, gourmet dishes and other recipes. Nata de Coco is one of the highest sources of insoluble dietary fiber, carbohydrate, vitamins and minerals, no cholesterol and low in fat. Starting a business in nata de coco production generates labor, employment and money. This livelihood endeavor is ideal in the country’s coconut producing areas. Mix grated coconut with water. Extract milk thru straining cloth. Dissolve sugar and add the rest of the ingredients and mix thoroughly. Pour 4 cups of mixture into clean sterile fermenting basins or jars (2 inches depth). Cover with manila paper and set aside undisturbed for 8-10 days. Harvest nata (approximately a minimum of 15 kilos and maximum of 30 kilos) and wash. Note: Always use clean and potable water and sterilize utensils and plastic containers. Nata used for processing should be smooth, white in color, firm in texture and preferably 1 to 1.5 cm. in thickness. Soak newly harvested nata in water to facilitate removal of scum. Scrape off the milky curd. Wash thoroughly. Cut the nata de coco uniformly into desired size, preferably 1.5 x 1.5 inch. Remove the sour taste and odor completely by soaking in water for 2 days in several changes of water until acidic taste or smell is completely removed. Boil in water. Drain. Weigh. For 1 kg. of nata de coco, add 3/4 kg. of refined sugar. Mix thoroughly and let it stand overnight. Boil for 10-15 minutes or until nata becomes transparent. Desired flavoring may be added. Drain, set aside the syrup. Prepare syrup by boiling 2 parts water and one part sugar. Combine with syrup from the drained nata. Add 0.1% citric acid for every 1000 ml of syrup. Pack nata in dry, sterilized glass jars. Pour hot syrup. Remove air bubbles. Cover tightly. For every 10 days, the average harvest of Nata de Coco is 20 kilos. Nata de Coco production is twice a month, totaling 4 working days/month for the production of Nata de Coco grower (2 working days) and Nata do Coco in heavy syrup (2 working days). If you need bottles packaging, please visit the website – http://www.synergospackaging.com . Thanks! God bless!